Parasail a Adrenaline Rush of Adventure. 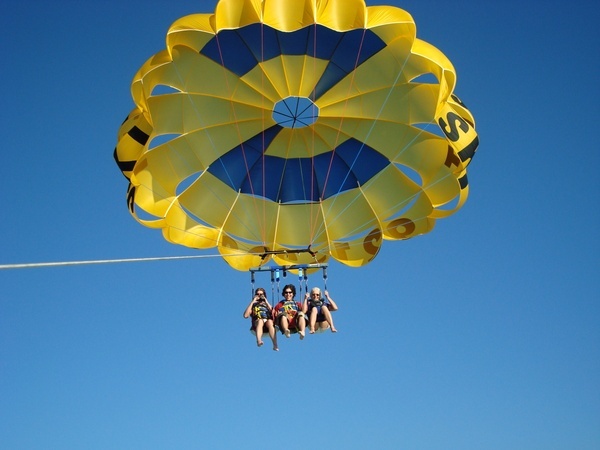 Let us start by what is Para-sailing, it is a water sport or sight seeing usually offered by water sport rental places. We went first time to south Florida to be more exact Ft. Lauderdale area last year and seen a cool flyer on the beach handed to us by a flyer girl, so it was a huge discount for all sort of other services they had, such as jet-ski’s even Banana Boating and so on, so we went and talked to the people got us all set up in harnesses instructed us about all the safety we need to know. So what is Para sailing you ask? Well it is just like parachuting only difference is your in much lower altitude then jumping out of a airplane to take that as an example, it is amazing once you are raised in the sky’s of course being pulled by a boat the view is something you have to experience in order to know how it feels, we certainly did not want to come back down for at least another hour from the sky’s over the Ocean. We really enjoyed our stay in Florida by the Lauderdale area and the Boat Rental company was very friendly to us and parachute sailing is certainly something everyone should try! Which you can find out more information here.